Apparently one of the great train journeys full of rewarding experiences (Lonely Planet guide), the Trans Siberian Railway was our primary form of transport for two weeks. I'm not sure who considered it rewarding, surely nobody who has travelled from 2nd class down. 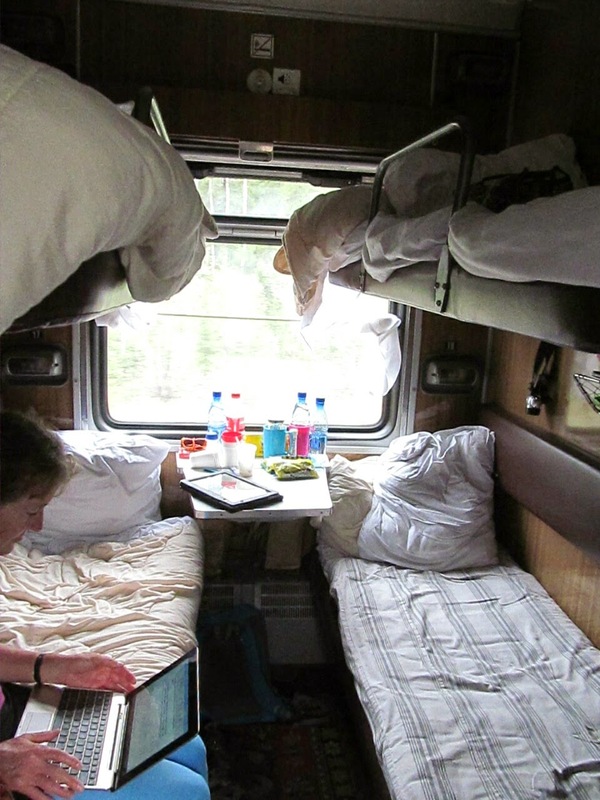 Four to a cabin, trapped for up to four nights (or more) in a tiny roughly 2m x 2m room, dining car optional, no showers and no forms of entertainment except drinking vodka, playing dominoes and assorted card games, reading, and writing blogs. Excitement consisted of knowing the three or so times per day when we would stop longer than 20 minutes so that we could stretch our legs and go hunting for a decent shop to replenish food supplies (normally only snack food available: chips, Coke and the like). This is more of an endurance test than a rewarding experience. Other exciting moments occurred during border crossings. 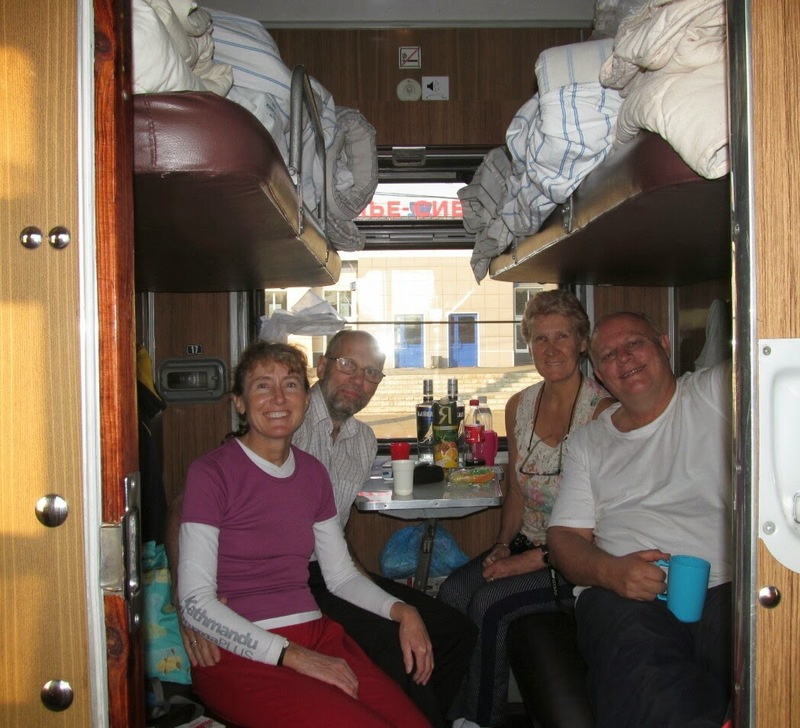 The switch over from Beijing to Mongolia required a change of wheels because the track width changed, so the train was jacked up several metres and then dropped back down to the platform with us in it. The 7 hour plus night time transition between Mongolia and Russia involved being unceremoniously woken and ordered to stand up and produce passports by uniformed figures standing ominously in cabin doorways. One of our number had partaken of a little too much vodka and was getting up too slowly for the border guards who started raising their voices, making me a little apprehensive. 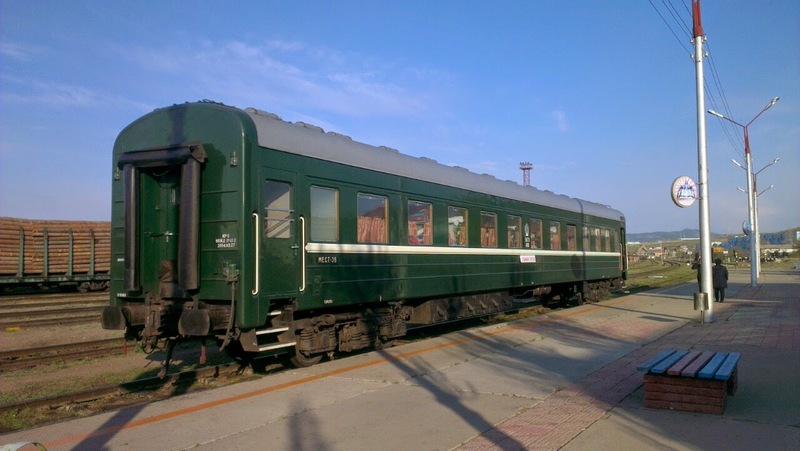 In the morning we stepped on to a station platform to find our carriage completely by itself on a long lonely track: no engine, no dining car, like an alien spaceship on a foreign planet. We hopped back in the carriage and a passenger asked if we had a dining car...hmm, perhaps you should step outside and have a look for yourself. Umm, where is the rest of the train? Finally, the number one exciting thing to do on the train? 20-30 minutes before a major stop staff would lock the toilets and not open them again until 20 - 30 minutes after leaving. Depending on how long the stop is this can mean an hour and a half without access to the toilets, unless you want to race along the platform looking for a toilet, that will normally be charged for, and get back before the train leaves. So it became a cat and mouse game to try to use the toilets before they were locked. Several times she would be at the door just as you arrived, turn the key while looking at you, and when you politely used sign language to request one more chance be given you got a stern look and the very forceful 'nyet'. No ifs or buts. I think it was the part of their job they enjoyed the most. I'm lying here in our cabin on Day 3 of our trip from Irkutsk to Moscow in the early morning, watching Elizabeth doing demi plies off the curtain rod in the passage. One day still to go and Elizabeth has regressed to her childhood ballet classes. Another weird thing: Russia's trains run on Moscow time and that's really hard to get used to. Even in Irkutsk where there was a 5 hour time difference from Moscow, all of the times on the station noticeboards were 5 hours early. On the train the 'real' time seems to be dependent on who you ask, our one free meal per day seems to come whenever they get around to it (the choices being 'do you want it or not'), and I've been changing the time on my phone one hour per day but need to remember how many hours I've changed to calculate the times at stops as they're all in Moscow time. Getting stuck at a station in Russia because I thought we had 25 minutes when we actually had 12, and with my passport on the train, would be my own special version of Hell. This mode of travel does give you the experience of the vast size of the country, the changing climate, the variable scenery and the different styles of architecture throughout the countryside. It also allows you to hop on and off along the way. For instance, although our train trip is from Beijing to St Petersburg we stop off for several nights at Ulaanbaatar, Irkutsk and Moscow. Well, time for another cup of coffee in my plastic cup, a muesli bar, and my dreams of a hot shower and a decent walk in Moscow.